American made off road motorcycles, as well as parts. Manufacturer of automotive camshaft systems for motorcycles, automotive and industrial engines. Includes product catalogue and company information. manufacturer of sealed lead-acid battery for applications such as motorcycles and automotive. hong kong, china. American maker of high performance limited production motorcycles. 'Enthusiasts' sell motorcycles, scooters, ATVs, parts, and accessories. Describes the various models available. Hand-built motorcycles with blueprinted engines. Producer of Bespoke classic motorcycles, using the original Rickman designs and jigs. Manufactures and distributes both on and off-road motorcycles and atvs. Triumph motorcycles, parts and accessories dealer in the U.S.
Dealer for electric and gas powered models. Motorcycles and ATVs are also sold. Located in Utah. Virginias newest Victory Motorcycle Dealership. Offers new and used motorcycles of most manufacturers. Manufacturer of high performance limited production motorcycles. Site has specifications and pictures, and ordering information. Produces American V-Twin motorcycles equipped with powerful motors, custom paint and use of chrome components. The Complete Online Store for the European Motorcycle Enthusiast - Including Motorcycles, Riding Apparel, Parts, & Accessories. The Souths newest exclusive BMW dealership. Offering the complete line of BMW motorcycles, riding apparel, accessories and service. Provides single and multiple motorcycle shipments directly to the end retail buyer or qualified dealer and purchase motorcycles on your behalf. New motorcycles, accessories, and clothing. We also have a full parts and service department. We have been selling and servicing motorcycles since 1994. New and used motorcycles and accessories, including backrests, shelf for GPS or radar detector, highway peg kits, light and handle bar risers. Manufacturer of Engines, Motorcycles, Scooters, ATVs, Mocars(4-wheel-Motorcycle), Multi-Passenger Mocar and Water Motorcycles (Petrol & LPG). BMW Motorcycles, New & Used Parts and Accessories. Producer of brake drums, motor cases, pressure seals, and spare parts for cars and motorcycles. Serving the automotive, textile, mechanical, and electrical industries. Weights for single pieces from 3 grams to a maximum of 6 kg. Australian distributors of Kazuma ATVs, motorcycles and scooters. Includes products images and dealer listings. Dealer in accessories, parts and repairs for Suzuki, Bombardier, Arctic Cat ATVs and motorcycles, Husaberg bikes, KTM motorcycles. Dealer in accessories, parts and repairs to Suzuki, Bombardier, and Arctic Cat ATVs and motorcycles, Husaberg bikes, and KTM motorcycles. Providing The San Francisco Bay Area with quality service. Sales, parts and service for Honda, Yamaha, and Kawasaki motorcycles, ATVs, dirtbikes, scooters and watercraft. New yamaha, all used motorcycles, genuine spares, accessories, finance, insurance, fully equipped workshop, yamaha dealer over 30 years. Ginas BMW Motorcycles, Inc. is one of the largest exclusive BMW motorcycle retail. Builder of Custom Motorcycles in Mesa Arizona. Also does custom motorcycle paint work. If the business hours of ATK Motorcycles in may vary on holidays like Valentine’s Day, Washington’s Birthday, St. Patrick’s Day, Easter, Easter eve and Mother’s day. We display standard opening hours and price ranges in our profile site. We recommend to check out atkusa.com/ for further information. 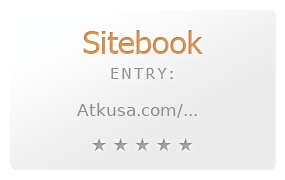 You can also search for Alternatives for atkusa.com/ on our Review Site Sitebook.org All trademarks are the property of their respective owners. If we should delete this entry, please send us a short E-Mail.